Starbucks Corporation (Nasdaq:SBUX) is so cool right? So I slip in this morning for a quick Grande [Pikes Peak if you must know] and I decide on a toasted bagel with cream cheese. To go. I’m going to munch in my car and hope for no accidents. Been working for years. I drink my coffee black in part because I am not that complicated. I open the bag to find one toasted bagel, one plastic knife encased in more plastic and two microscopic servings of cream cheese in those individual packs just like jam at a dinner. Except I’m driving a car and this does not meet my needs for immediate nutrition. Trying to be green I am not impressed with the plastic which I must now responsibly re-cycle. To the VP finance today this was high margin because they did not have to spend labour hours for a barista to spread cream cheese on a bagel. Although you have to question the costs of each packet versus restaurant sized tubs. To the VP marketing you have a disappointed customer. I expected the food to be ready to eat. I was not aware that I was to be part of the kitchen staff. 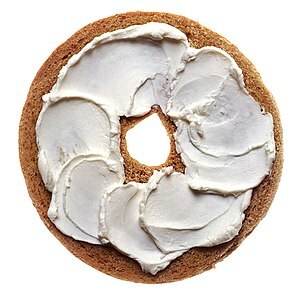 At your prices I do not expect to spread cream cheese on a my bagel. When will customer experience disappointments intersect and overwhelm margins which are not sustainable. Deep strategic issues for Starbucks. I’m still OK with Pikes Peak but not the bagels. Starbucks you are vulnerable. Soon you may have a bagel protest. George Gutowski writes from a caveat emptor perspective. This was personal but then it became business. I hold not positions in stocks mentioned in this post. I have no plans to initiate new positions within the next 72 hours.